Or if I die. …………. Une mouche comme toi ? Ou n'es-tu pas un homme comme moi ? The speaker draws a comparison between himself and a fly that he has thoughtlessly brushed away. He asks if he is like the fly, or the fly is more like himself. He imagines another, greater hand, perhaps that of God, brushing him away some day and ending his private designs. He concludes with the belief that he is indeed like the fly, not in his insignificance to Fate or chance, but in the fly’s significance in the natural world. Just as the fly dances and sings, so does the speaker. Thought is what gives him life and breath, and “the want/Of thought is death.” He takes joy simply in existing, with little thought or worry over what tomorrow may hold. This five-stanza poem takes on a playful rhyme scheme and meter, despite its serious and somewhat morbid subject. The first four stanzas are ABCB quatrains, each made up of terse lines to communicate the brevity of life, which is the subject of this poem. The final stanza, however, is an AABB rhyme scheme, a pair of rhyming couplets, which lends an even more playful quality to the poem as a whole while offering a moral or coda to the entire work. 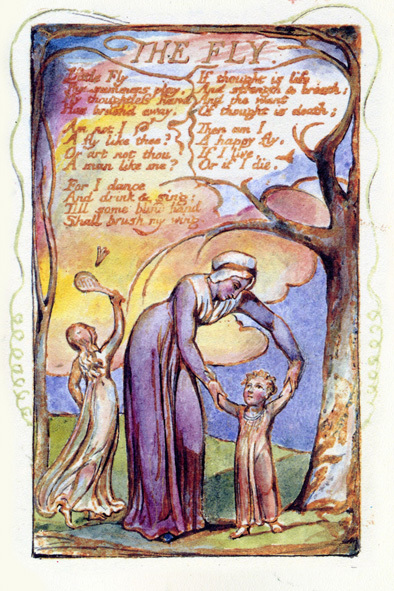 This poem also returns to Blake's theme in Songs of Experience of the place of thought in the quality and quantity of human life. The speaker harms the fly with his "thoughtless hand," indicating that thoughtlessness leads to death. Whatever power exists higher than the speaker may also be thoughtless or completely indifferent to human life, but that cannot be changed. The speaker thus resolves to live each moment fully, but his moment of contemplation leads him to this life-affirming conclusion. 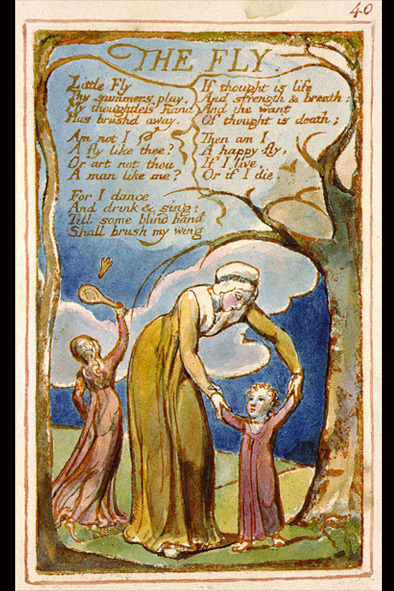 Blake printed the poem with the text set in the branches of trees, an image of a nurse and a toddler in the foreground, and a girl with a racket about to hit a shuttlecock in the background. G.S. Morris notes that 'the lines "Till some blind hand / Shall brush my wing" seem to follow the feathered shuttlecock directly into the little girl's racquet. The poem catches the narrator in an act of thoughtlessness that leads to the contemplation of the act and its implications. 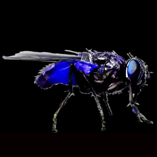 The fly suffers from uncontrollable circumstances, just as the narrator does. This humbling simile has caused the narrator to move from thoughtlessness to thought, and, as "thought is life", from death to life, allowing the conclusion, "Then am I / A happy fly / If I live, / Or if I die", a conclusion to which Paul Miner comments, "Brain-death is real death." 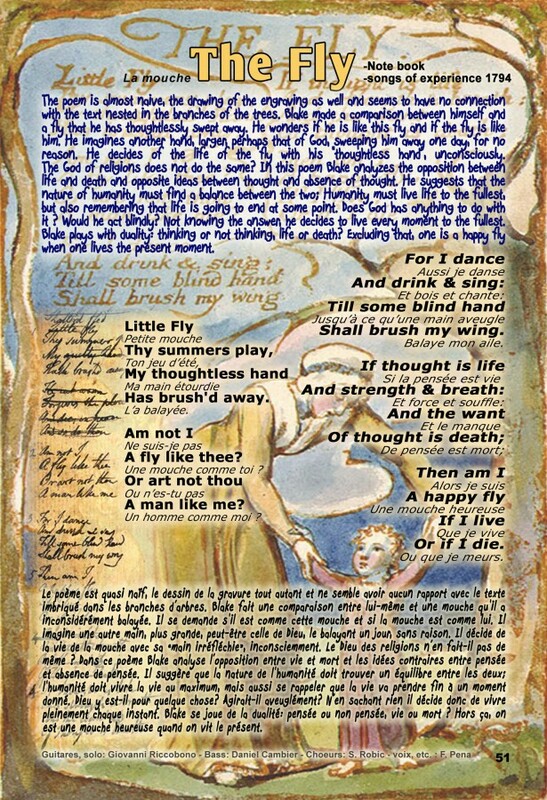 "The Fly", written by William Blake, is a poem that exemplifies the use of symbolism to analyze and explore the idea and meaning behind life, and the antithetical parallel: death. But, behind the deeper meaning, there are quite a few structural and rhyme patterns that set the tone for more the rest of the poem. The poem itself consists of five stanzas, each with four lines. Using this structure allows for the reader to focus on the message Blake is trying to convey. The second and fourth lines in each stanza encompass the technique of ending rhyme. For example, "Little fly/ Thy summer's play/My thoughtless hand/Has brushed away" (Lines 1-4, Blake "The Fly"). In doing so, it adds conformity and structure to the poem. With these common elements throughout, one may explore the idea and meaning behind both life and death through Blake's excellent use of symbolism in his story. 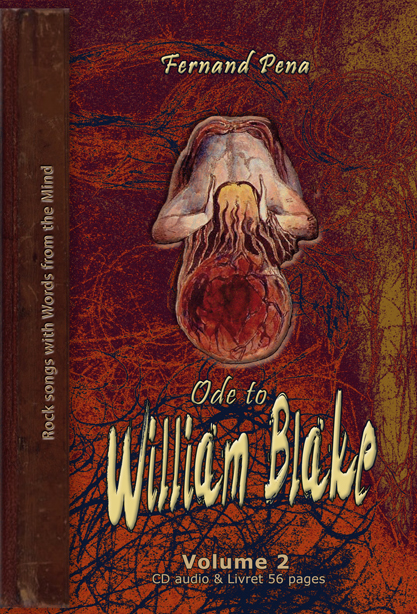 The story itself is carefully crafted, with Blake himself as the first-person narrator. The speaker reveals a story of an experience in which he accidentally brushed away the life of a carefree and innocent creature: the fly. As Blake considers the deeper meaning of this action, he also dives in the reflective idea of how his life is more important than that of a fly's. Blake questions the worth of human existence through the comparison between our importance, and the objects, creatures, and even people that human beings consider to be unimportant. 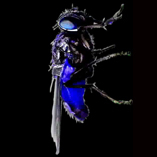 The fly represents these objects, creatures, and people. "Am not I/A fly like thee?/or art not thou/A man like me?" Blake asks (Lines 5-8, Blake "The Fly"). Through this symbolism, readers are forced to question his or her own life: How does humankind reflect upon the less-developed elements of the universe? What makes mankind so superior? As Blake attempts to answer this question, he reaches upon the idea of conscious thought versus the lack of thought. He suggests that in society, thinking and breathing is what life is at its fullest, a quality that humankind does not know if the fly has the ability to do. On the other hand, the lack thought and intelligence represents death. Regardless of the shape, size, or species of the creature or individual, Blake asks what the difference is between them intellectually. How can we put off such a different individual when we are not the creature or individual himself? As humans perceive it, the fly doesn’t have any understanding of what death means, therefore it lives its life not worrying about death, and the consequences that await it. In saying that, Blake considers himself to be like a fly, as he doesn’t see any knowledge that necessarily opposes that viewpoint. 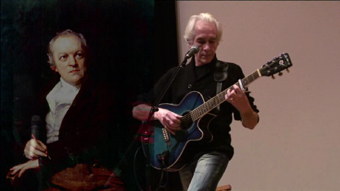 In the last stanza, when Blake says, “Then am I/A happy fly/If I live,/Or if I die” he is suggesting that the nature of mankind should find a balance between both; humankind must live life to the fullest, but also remember that life will come to an end at some point (Lines 17-20, Blake “The Fly”). Though this explanation would likely be the more modernized interpretation, it is also important as a reader to keep in mind that Blake’s poetry often questioned the religion of his time. 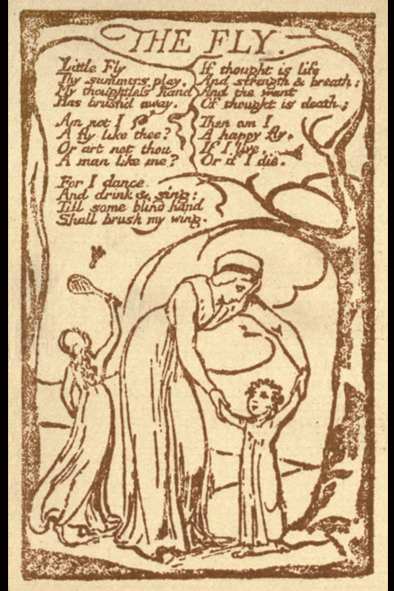 In the third stanza, Blake pokes at the idea of a “blind hand” which would end the life of the speaker. This reveals that the speaker is questioning how religion controls the individual. Does God have the power to control when one dies? This question, although not fully answered provides insight into some of Blake’s ideas on theodicy. 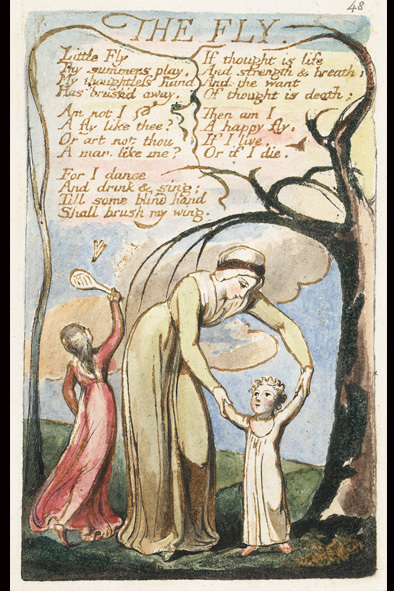 In all, each element of this poem has a specific role, which seems to be a common theme in all of Blake’s poetry. 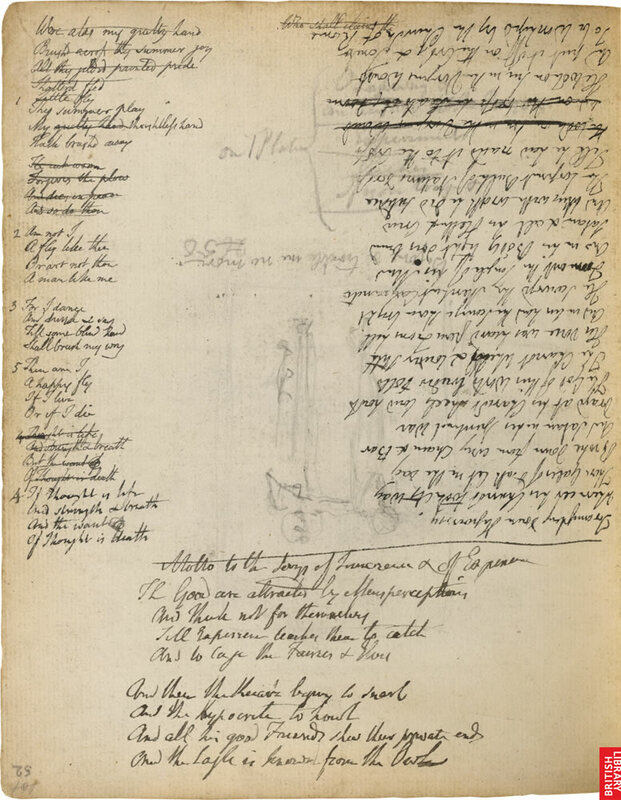 Through structure, symbolism, and language, and the questioning of religion, Blake forms a poem that analyzes the opposites of life and death and also the contrary ideas of thought and the lack of thought. L'orateur établit une comparaison entre lui-même et une mouche qu'il a inconsidérément balayée. Il lui demande s'il est comme la mouche ou la mouche est plus comme lui. Il imagine une autre main, plus grande, peut-être celle de Dieu, lui essuyant un jour et se terminant ses desseins particuliers. Il conclut avec la conviction qu'il est bien comme la mouche, pas dans son insignifiance au destin ou du hasard, mais dans la signification de la mouche dans le monde naturel. Tout comme la mouche danse et chante, plus le haut-parleur. La pensée est ce qui lui donne vie et souffle, et «le manque / de la pensée, c'est la mort." Il prend la joie simplement en existant, avec peu de réflexion ou d'inquiétude sur ce que demain nous réserve. Ce poème de cinq strophes prend une rime et le mètre ludique, malgré son sérieux et un peu morbide sujet. Les quatre premières strophes sont des quatrains DGCGBR, eux-mêmes constitués de lignes laconiques de communiquer la brièveté de la vie, qui est le sujet de ce poème. La dernière strophe, cependant, est un schéma de rimes AABB, une paire de couplets rimés, ce qui donne une qualité encore plus ludique pour le poème dans son ensemble, tout en offrant une morale ou coda de l'œuvre entière. Ce poème renvoie également au thème Blake dans Chants d'Expérience de la place de la pensée dans la qualité et la quantité de la vie humaine. L'orateur nuit à la mouche avec sa «main irréfléchi", indiquant que la légèreté conduit à la mort. 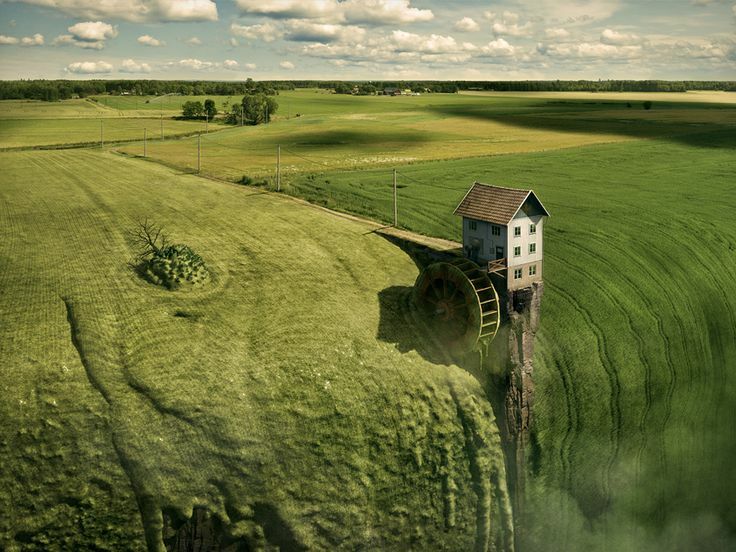 Quel que soit le pouvoir existe plus élevé que le haut-parleur peut également être étourdi ou totalement indifférent à la vie humaine, mais qui ne peut pas être changé. L'orateur décide donc de vivre pleinement chaque instant, mais son moment de contemplation l'amène à cette conclusion affirmation de la vie. "The Fly ", écrit par William Blake, est un poème qui illustre l'utilisation du symbolisme d'analyser et d'explorer l'idée et la signification de la vie, et le parallèle antithétique: la mort. Mais, derrière le sens profond, il ya pas mal quelques modèles structurels et les rimes qui donnent le ton pour plus du reste du poème. Le poème lui-même se compose de cinq strophes, chacune avec quatre lignes. Cette structure permet au lecteur de se concentrer sur le message Blake essaie de transmettre. Les deuxième et quatrième lignes dans chaque strophe englober la technique de mettre fin à la rime. Par exemple, "Petite mouche / ta été l 'play / Ma main étourdie / a essuya " (lignes 1-4, Blake "The Fly "). Ce faisant, il ajoute de la conformité et de la structure du poème. Avec ces éléments communs à l'ensemble, on peut explorer l'idée et la signification de la vie et de la mort grâce à l'utilisation Blake 'excellent du symbolisme dans son histoire. L'histoire elle-même est conçu avec soin, avec Blake lui-même comme le narrateur à la première personne. L'orateur révèle l'histoire d'une expérience dans laquelle il a accidentellement essuya la vie d'une créature innocente et sans soucis: la mouche. Comme Blake considère le sens profond de cette action, il a également plongées dans l'idée reflète la manière dont sa vie est plus importante que celle d'une mouche 's. Blake remet en question la valeur de l'existence humaine à travers la comparaison entre notre importance, et les objets, les créatures, et même des gens que les êtres humains considèrent comme sans importance. La mouche représente ces objets, les créatures et les gens. "Suis-je pas / Une mouche comme toi? 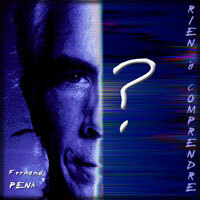 / Ou N'es-tu pas / Un homme comme moi? " Blake demande (lignes 5-8, Blake "The Fly "). Grâce à ce symbolisme, les lecteurs sont obligés de remettre en question sa propre vie: Comment l'humanité réfléchir sur les éléments les moins développées de l'univers? Ce qui rend l'homme si supérieur? Comme Blake tente de répondre à cette question, il atteint sur l'idée de la pensée consciente contre le manque de réflexion. Il suggère que, dans la société, la pensée et la respiration est ce que la vie est à son maximum, une qualité que l'humanité ne sait pas si la mouche a la capacité de le faire. D'autre part, le manque pensé et l'intelligence représente la mort. Quelle que soit la forme, la taille, ou l'espèce de l'animal ou une personne, Blake demande quelle est la différence entre eux intellectuellement. Comment pouvons-nous remettre un tel individu différent quand nous ne sommes pas la créature ou individu lui-même? En tant qu'êtres humains le perçoivent, la mouche n'a pas de compréhension de ce que signifie la mort, par conséquent, il vit sa vie sans se soucier de la mort, et les conséquences qui l'attendent. En disant cela, Blake se considère comme une mouche, car il ne voit pas la connaissance qui s'oppose nécessairement ce point de vue. Dans la dernière strophe, quand Blake dit: «Alors que je suis / Une mouche heureux / Si je vis, / Ou si je meurs», il suggère que la nature de l'humanité doit trouver un équilibre entre les deux; l'humanité doit vivre la vie au maximum , mais aussi se rappeler que la vie va prendre fin à un moment donné (lignes 17-20, Blake "The Fly"). Bien que cette explication serait probablement l'interprétation plus modern e, il est également important en tant que lecteur de garder à l'esprit que la poésie de Blake souvent remis en question la religion de son temps. Dans la troisième strophe, Blake pousse à l'idée d'une «main aveugle» qui mettrait fin à la vie de l'orateur. Il en ressort que le haut-parleur s'interroge sur la façon dont la religion contrôle de l'individu. Dieu at-il le pouvoir de contrôler quand on meurt? Cette question, bien que pas entièrement répondu donne un aperçu de certaines des idées de Blake sur la théodicée. En tout, chaque élément de ce poème a un rôle spécifique, ce qui semble être un thème commun dans toute la poésie de Blake. Grâce à la structure, le symbolisme et la langue, et la remise en cause de la religion, Blake fait un poème qui analyse les oppositions de la vie et de la mort et aussi les idées contraires de la pensée et de l'absence de pensée.